MANILA – The 350-hectare ‘Hacienda Binay’ features a horse ranch, man-made lagoon, imported orchid farm, 40-car garage, palatial mansions, resort swimming pool, separate staff quarters, 20-house air-conditioned piggery, a London-inspired maze park, and other facilities, claims former Makati Vice Mayor Ernesto Mercado. Hacienda Binay is about 6 times larger than the Luneta Park, about half as large as the whole San Juan City, and around 10 times the size of the Araneta Center, says a report on PhilStar. It is believed to be worth P1.2 billion, according to the estimates posted by ANC. Mercado has presented the ‘Hacienda Binay’ property before the Senate blue ribbon subcommittee through a video report of the aerial survey he made of the property. The survey was done in a helicopter, the former vice mayor said. Earlier this week, the camp of Vice President Jejomar Binay said that a helicopter flew over the property. They believed it was out to do an aerial survey on the farm they claimed just to be 9 hectares big. Mercado admitted he was aboard that helicopter and they were, indeed, doing an aerial survey of the property which measured 350 hectares big, not just 9 as the Binays claimed. Mercado claimed that the development of the 350-hectare property in Rosario, Batangas province, allegedly came from kickbacks received from then-Mayor Binay’s projects in Makati, says a report on the Inquirer. Not surprisingly, the property was developed by Hilmarc’s Construction Corporation who worked on the Makati City Hall 2 parking building and other Makati-funded projects. 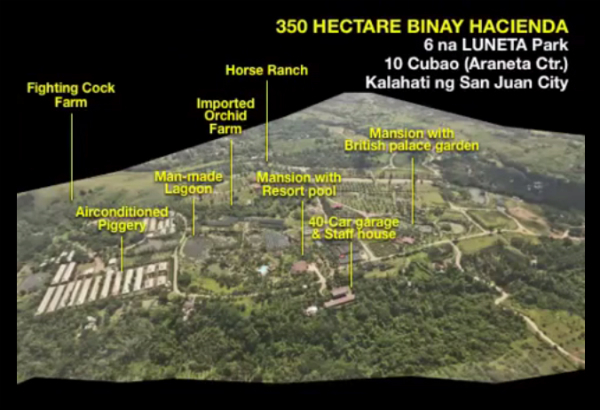 Hilmarc’s chairman Engineer Efren Canlas designed and built Hacienda Binay. When the property was being developed, Mercado alleged that the Binays would owe the company several millions yet Hilmarc’s had no choice but to continue with the construction jobs, according to the Inquirer report. Mercado claims that he would personally go to the Binays’ home to deliver money from the kickbacks; however, the VP’s wife, former Makati City Mayor Elenita Binay, often gets angry if he would take a portion of this money to pay Hilmarc’s. Thus, according to Mercado, the construction company was forced to increase the construction prices of the buildings in Makati to recover the money allegedly owed by the Binays.